A decade ago, the relationship between writing and design was seen by some of design’s more energetic and committed observers as one of the most exciting areas of development. Much was promised in those heady years. Design should involve itself as an equal partner in the creation of new kinds of text that put just as much emphasis on visual expression as on linguistic content. It was by no means the first time such calls had been made. They have occurred at regular intervals, over the past century, since El Lissitzky proclaimed that the new book demands a new kind of writer. Visual prose is a definite, though almost hidden, literary genre in its own right. There were good reasons to hope that the new digital tools, which for the first time combined all stages of writing production in a single, accessible device, might inspire a new school of writers. So far it hasn’t happened in print – for three basic reasons. First, because most writers have no desire to give up any aspect of their autonomy and no interest in extending the designer’s role. Second, because most designers don’t possess the degree of writing talent or commitment that ambitious writing requires (this is not meant to be harsh: designers’ primary skills and interests lie in design). Third, because without works produced in sufficient number to establish their place in the bookshops and reviews pages, there can be no viable market for books of this kind. Once in a while, though, a project arrives that makes you wonder again whether this new kind of writing could amount to something more substantial. VAS: An Opera in Flatland (Barrytown/Station Hill Press) is a novel by American writer Steve Tomasula, with ‘art + design by Stephen Farrell’. 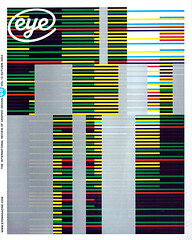 Their collaborations have previously been published in Emigre. Farrell receives an equal-sized cover and title-page credit, though the wording implies that the concept, as well as the writing, is Tomasula’s. In narrative terms, not much happens in 370 pages. In text length and scope, it is more like a long short story than a novel, but the pages teem with graphic incident and at key points the visual material takes over. VAS has four main characters: Square, who is considering whether to have a vasectomy, his wife Circle, their daughter Oval, and Circle’s mother, who would like them to have another child and is aghast to learn her daughter has had an abortion. The book’s theme, the genetic design of humanity, could hardly be more timely. VAS presents a mass of evidence about ideas in eugenics since the nineteenth century, showing how widespread and persistent, from Darwin to Mensa, is the idea that humanity should deny the ‘defective’ the right to reproduce. The authors show inheritance diagrams; damning instances of officialdom withholding medical treatment in the cause of ‘research’; tables comparing the brain size of different races and the body measurements of Miss America since 1921; and websites such as Ron’s Angels, which sells the eggs and sperm of the beautiful to the genetically desperate for thousands of dollars. VAS’s unconventional appearance makes it appear more demanding to read than it is. The text itself seems to be in an advanced state of genetic mutation, perpetually in the process of becoming something else. Many pages are laid out more like poetry than prose, and a cluster of vertical rules running through the book forms a kind of suture. While the documentary content is gripping and the page design gives considerable aesthetic pleasure, as fiction the story is not especially affecting: the characters are, quite literally, flat. The book is strewn with quotations from Edwin A. Abbott’s two-dimensional novel Flatland (1884) and this aspect of VAS seems needlessly distracting and distancing, even if we understand the graphic space the book inhabits to be a kind of ‘flatland’. What is harder to assess is the degree to which the agitated design might also be a barrier to full immersion in the writing. How would Tomasula’s story read as ordinary prose? Experiments such as VAS reject the traditional notion of typography as a transparent medium for the writer’s thoughts, but the effect of reading such a book is to be constantly reminded, with every page turn, that this is what you doing. While this challenge to the text’s too easily assumed authority is valid, it is much less interesting than the content. Tomasula deserves credit, though, for engaging in such a generous and original design experiment. VAS: An Opera in Flatland is a beguilingly intricate, immaculately crafted labour of love and anyone interested in the future of genetics or writing, or both, should seek it out.